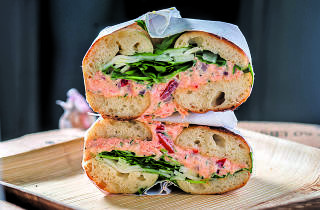 New York’s lox-and-schmear field is getting crowded, what with Team Torrisi’s nouveau appetizing store Sadelle’s and a forthcoming Jewish Museum location of stalwarts Russ & Daughters. Not to be outdone, Noah Bernamoff and Matt Kliegman—the brains behind those cult-inducing Manhattan-meets-Montreal bagels—unleash this larger, 1,500-square-foot East Village expansion in the former home of century-old Italian bakery De Robertis. The shop’s nostalgic penny-tiled floors and original tin ceilings have been restored, updated with custom tabletops and turquoise Thonet chairs. Inside, head baker Dianna Daoheung rolls out honey-boiled rounds topped with Black Seed standbys (tobiko cream cheese, beet lox), as well as exclusive new sandwiches including a wood-oven roast beef au jus with fresh horseradish and smoked salmon bookended with arugula, crème fraîche and a fried-caper omelette. The menu expands beyond sandwiches with chilled borscht, potato salad and pastries like Jewish rugalach and Italian rainbow cookies. We all know New York is known for its bagels and, as a New Yorker, there is nothing worse than a dry, boring bagel. Blackseed Bagel is one of the best bagel you will eat. This place doesn't go in for the rainbow bagel or any bizarre flavors. Rather Blackseed will provide you with a variety of delicious wood-oven bagels, baked to perfection- not too crunchy, not too big. The fillings are endless and personally, I am a fan of the BLT on everything toasted complete with delicious spicy mayo. This bagel is not over packed so that as soon as you pick it up it falls apart but is easy to eat and delicious through and through. The vibe is great- trendy music in the background and old school booths to enjoy your time in. Coffee is Stumptown coffee and completes this meal. Saturdays and Sundays get busy but luckily this gem is hidden from the tourists and rather a local jaunt for the East village. Nomnom. These are SUCH crazy good bagels. I was so excited when I realized this place had delivery - the hype was unreal and made me want to try it, but to be honest I would only wait in line for a bagel at Russ and Daughters, so I delivery seemed like the solution. Sunday morning at Black Seed in the East Village was quite pleasant and the bagel sammie was delicious too. Unlike some bagel venues, there was a certain calmness to the restaurant that you don't often experience on a weekend morning. I placed my order of a whole grain with egg, cheddar, and tomato, in a very timely fashion and I waited very little time at all. The bagel density was more bread-like than I am generally used to and would prefer a more spongey texture but the egg was cooked to perfection with the cheddar oozing over the sides. It was super indulgent. It's a must visit.